Arts King Gems Arts (Dongguan) Co., Ltd.
Dongguan Deyi Gems Handcraft Co., Ltd.
wholesale agate tumbled 8 mm stones These gem stones are the best quality available. All stones are natural and not synthetic (produced in the laboratory). Natural gemstones are useful for healing or meditation, as the cost of tumbled stones is very affordable. 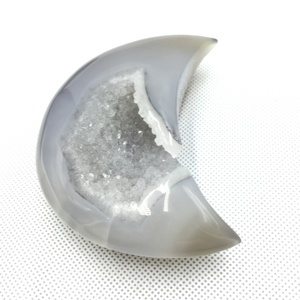 Selenite Agate Craved Agate Hand Craft Bowls.. Bubble packing As per customer requirement we are able to shipped . We have acquired huge response from each of our customers due to which we are looking forward to expanding our base all the more. Thank you for your precious time and we hope you like our products. 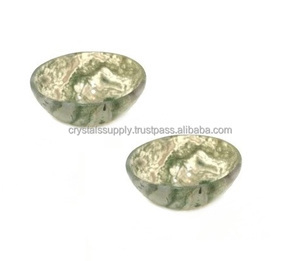 Product Details: Product : Gemstone Bowls Stone : Moss Agate & also Avaliable in various Gemstone Size : Avaliable in size 2,2.5 & 3Inch Price : Please register at for wholesale prices Shape of stone : Bowl Kabeer Agate Exporters is a leading name in Manufacturer,Wholesaler & Exporter of all kind of Arrowheads,Metaphysical, New Age, Esoteric, Dowsing, Reiki, Fengshui, Pagan, Wiccan, Spiritual & Chakra Products. We are professional manufacturer of gemstone products We provied excellent quality genuine Stone Available Stones Crystal Quartz, Rose Quartz, Amethyst, Golden Quartz, Lapiz Lazuli, Tiger Eye, Labrodolite, Sodalite, Green Aventurine, Blue Aventurine, Blood Stone, Moss Agate, Snow quartz, Carnelian, Moon Stone, Sun stone, Sea Fossil, Red Jasper, Black Agate, Tourmaline, Black obsidian, Snow Flake Obsidian, Amber, Pyrite, Green Florid, Rainbow florid and many more. Our Key Products Arrowheads, Healing Wands, Gemstone Pendulums, Metal Pendulums, Massage Wands,Obelisks, Tower, Angles, Skulls, Merkaba Star, Chakra Sets, Reiki Sets, Pagan & Wiccan Sets, Geometry sets, scared Geometry sets, Crystal Points, Puffy Hearts, Pyramids, Shiva Lingums, Shiva Eyes, Spheres, Runes sets, Jap Malas, Conical Pyramid, Energy Generators, Bowls, Bracelets, Pranic Disintegrator, Worry Stones and many other customize products. 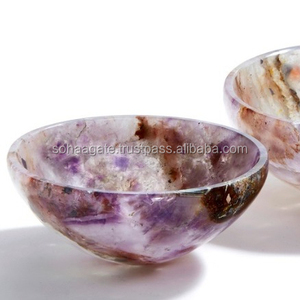 Wholesale Moss Agate Bowls 2"
Shantou Bitefu Jewelry Co., Ltd.
3.Q:What is the material of your products9 A:The material is natural crystal. 4.Q:How can I get some samples9 A: We are honored to offer you samples. 5.Q:How does your factory do regarding quality control9 A:Quality is priority. 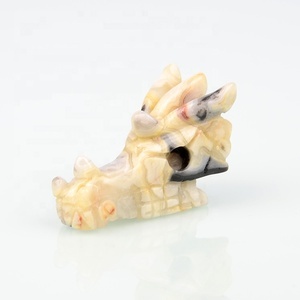 Alibaba.com offers 17,589 agate carving products. 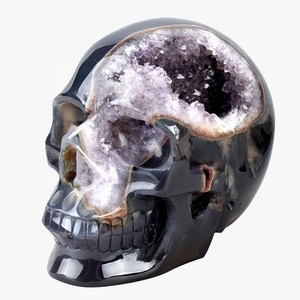 About 56% of these are semi-precious stone crafts, 24% are crystal crafts, and 6% are sculptures. A wide variety of agate carving options are available to you, such as home decoration, holiday decoration & gift, and art & collectible. You can also choose from folk art, antique imitation, and feng shui. As well as from china, europe, and india. And whether agate carving is sculpture, figurine, or ball & globe. There are 17,418 agate carving suppliers, mainly located in Asia. The top supplying countries are India, China (Mainland), and Hong Kong, which supply 55%, 43%, and 1% of agate carving respectively. Agate carving products are most popular in North America, South America, and Eastern Europe. You can ensure product safety by selecting from certified suppliers, including 1,833 with Other, 149 with ISO9001, and 5 with BSCI certification.